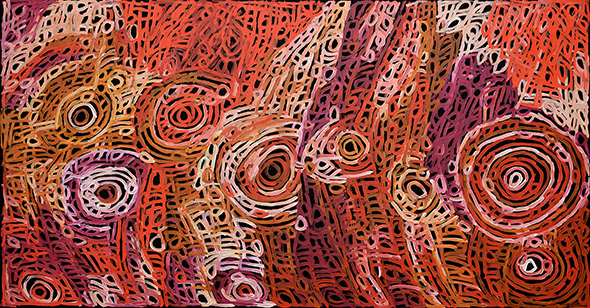 Many women's contemporary paintings feature Awelye, Body Paint, made famous by the 'striped breasts' compositions of the famed and now deceased Minnie Pwerle. Minnie's daughter, Betty Mbitjana, and granddaughter, Charmaine Pwerle, have taken up the story and now paint their own versions of it, adding their own artistic take to the mix. 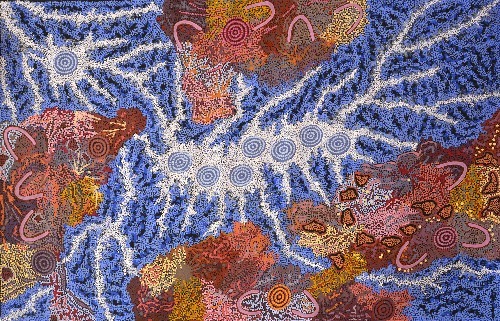 Many Indigenous artworks reflect body paint designs, whether ceremonial and private or merely decorative. Usually the work is a combination of the two. In the same way as Indigenous people painted their bodies, they painted objects that were used for ceremonial purposes or just for day to day living. This can't be ignored as an art form and indeed it is common to many peoples worldwide. What is fascinating is the transcription of artwork that was once relegated only to objects and bodies to the rectangular form of the canvas. All at once we have a different kind of art; a record of something that was well before our time and a contextual link to an ancient purpose – even if we don't know the meaning exactly, we can gain a feel for something that existed and was important thousands of years ago in our still living Indigenous culture.